Over the spring and summer months GS Henley are running a Thursday evening chaingang on a 10km circuit between Twyford and Wokingham. This will be a fast-paced ride, aimed at improving race strength and skills. A staple of race training, a chaingang (or paceline, if it’s a single line of riders) is when a group of cyclists work together to hold a much higher pace than they could do individually. It requires good handling and awareness, as well as a reasonable level of fitness. The riders will rotate on the front of the group, sharing the workload, and benefitting equally from the draft. This means riding in close proximity, often at high speed…as such, communication between riders and good bike handling is key for a safe experience. It’s a technique you often see the pro’s using in Team Time Trials, during breakaways, or when a team is chasing down a break. The GS Henley chaingang session will start once there is enough evening light (typically when sunset is 8pm or later), and will run throughout summer. We meet outside Twyford Train Station on Hurst Road, then head out to do 4 laps of a fairly flat, fast 10km circuit, before finishing with a run-in to Twyford. 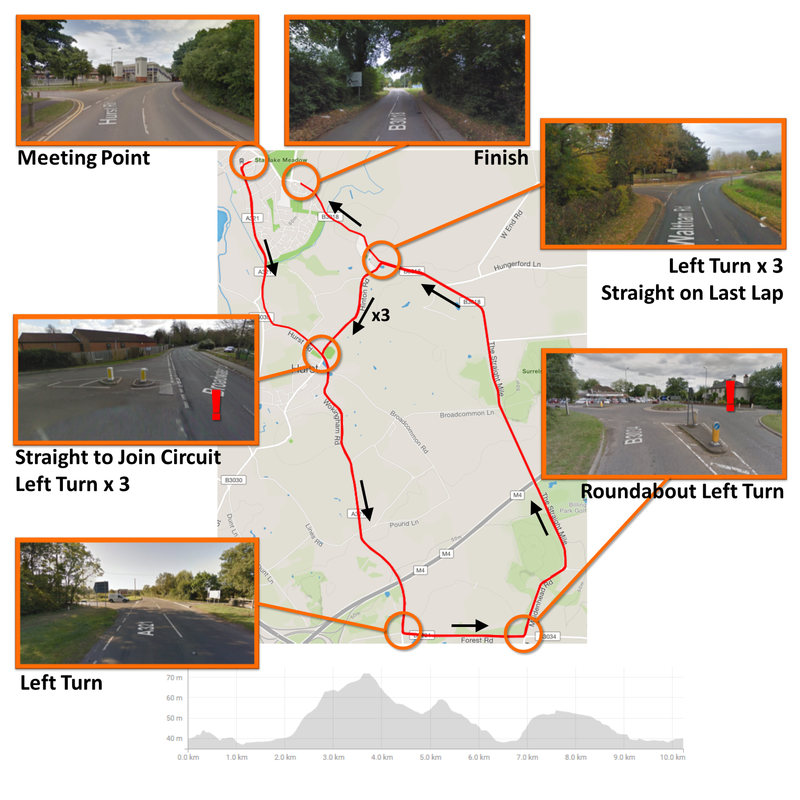 There are 4 junctions on the circuit, 2 of which we do not have right-of-way to traffic approaching from the right (turning left from Hinton Road to Wokingham Road, and the Warren House Roundabout). Riders should take care at all junctions, however there should be particular care taken at these 2 turnings. The key to a safe, fast chaingang is good discipline, observation and communication. It should also be pointed out that you should be on a mechanically sound road bike. TT bikes are not to be used. We will endeavour to nominate a leader for each group, and if you are considered to be riding un-safely you will be politely warned. Continued dangerous riding will result in you being asked to leave the group, for the safety of other riders. We’ll also aim to improve your group-riding skills, advising on positioning, cornering and hand signals. Chaingangs are a drop-ride. They are not a race, however they will be fast. The circuit we are using is mainly flat, however it has a mile long drag averaging 1%, with gradients up to 4%, and while there will be no attacking, the pace will remain high over this. If you are dropped from the chaingang, or have a mechanical, then you have the option of waiting for the next lap (or group, if we have multiple groups), or use one of the cut-through roads and re-join on the other side of the circuit. Depending on attendance we will be running multiple groups (aiming for a maximum of 8 riders per group) at differing paces. For reference, a faster group will average 40-42km/h, depending on conditions. We meet at Twyford Train Station (Hurst Road side) on Thursday evenings. If you’re planning on coming along, email roadrace@gshenley.com beforehand to double-check the meeting times, and to make sure we have your contact details. GS Henley members can post in the forum, and this would be a great way to arrange groups of riders with similar pace. It’s strongly recommended that you make yourself familiar with the circuit and the junctions beforehand. It’s advised that you get warmed up, as it’s only a couple of kilometres from the meeting point to the circuit, and the pace may be reasonable quick immediately. We’ll be setting off fairly promptly at the scheduled start time. If you’re late, then head up to the circuit, and ride round clockwise, and you should be able to jump on board for subsequent laps when the groups come by. You may need lights on the way home, and you should also bring your normal repair kit (inner tubes, pump etc) in case you have a mechanical. If you are stranded, let someone know via email/Whatsapp, and once the ride is over we can send someone over to help.